Our wall murals are made of a high quality sticking back vinyl material, using UV rated inks for maximum durability and long term use. Our murals are not made of paper material: hence, it won’t tear and it won’t stretch, making it so easy to install. No need for glue or mud! Our wall murals are sticking back which makes the installation clean and fast. No more mess, and no need to run to the hardware store to get tools! 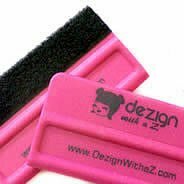 And by the way, the felt squeegee is offered with any purchase of a wall mural! Squeegees are a very useful tool for vinyl wall murals application. Our wall murals are manufactured within 7 business days. You can choose from our on-line catalog selection, or you can send us your own picture and we will manufacture your own personalized wall mural! There is no real minimum or maximum mural size. Whether you want an extra gigantic mural, or a microscopic one, we can still manufacture it! Our Murals are 100% trimmable: you can trim it to fit any space, whatever shape it may be. Feel free to contact us directly for specific dimensions and pricing. What is the price for a Wall Mural? Price for a Wall Mural is based on the square footage. If you decide to go for a Custom Mural, additional costs may apply based on the complexity of your project and extra work we may have to put in. We also have special rates for professionals and affiliates. Mural samples are available for purchase. You will receive it in the mail. 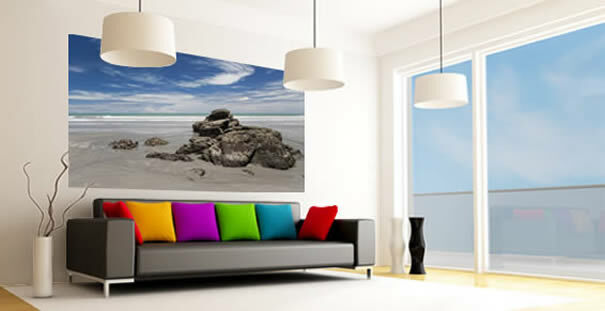 The sample cost will be credited back on your final order of a Wall Mural. Are Dezign With a Z Murals easy to install? Installation is hassle free! Our Wall Murals do not require the need for professional tools, glue or mud! We also have made your installation easier with marks directly inlaid in the mural print, so you don’t have to struggle during the adjusting process. For extra large murals we recommend that you get a friend to help. It’s easier, faster and more fun! Can Murals be installed on rough surface? Our murals can be installed on any smooth surface. If you are installing on a non-porous flat surface such as windows, glass, mirror… use the wet technique: spray water onto the surface before applying the mural; this way you will be able to easily reposition the panels while installing. Let it dry; once the surface has completely dried, the Mural will adhere strongly. If your walls are slightly textured, or painted with gloss or semi-gloss, it’s not a problem either! Simply use a medium grit sandpaper to roughen the surface prior to installation. If you have a rougher surface such as very textured walls, cinder block, rough wood panels or an unpainted bare wall, prepare your surface before installing: use a liner paper, then apply 2 coats of a flat latex paint (you will find it in any hardware store or paint store). If you are not sure about your surface, call us (we love to help) or ask your General Contractor. Are Murals removable and safe? Our Murals are safe and fire rated. Hence our Murals are appropriate for any type of Residential or Commercial project. Our Murals are easy to remove. No need for specific tools. They won’t damage your walls, nor will they leave residue. However be gentle at removal since Dezign With a Z can not be held responsible for damages caused by an uncareful removal. Feel free to contact us for any assistance prior to removal. Simply use a clean cloth. For deeper cleaning use a wet sponge and a clean cloth to dry. However be gentle: scrubbing to hard, using rough materials or chemical products may damage the mural. We don’t recommend the use of any household cleaning products. Are Murals fit for extreme situations? If you plan to install your Mural in a bathroom or a moist area, it’s fine, it will hold perfectly. Simply make sure the surface is perfectly clean and dry before applying. To ensure a long durability of your Wall Mural in this type of environment, protect it with 2 coats of water-based polyurethane. Wall Murals are mainly intended for interior use, and will last for years and years. You can use a Mural outside in protected/shaded areas. It will still last for years. For exposed outdoor areas, we can not guarantee a long term use. Please contact us for any outside use prior to installation. We will be glad to give you the right piece of advice.